Last year I was fortunate enough to attend the MADE Festival in Sheffield on behalf JCI Sheffield This year the festival will be from the 19 -22 September and is due to run a series of high profile events around Sheffield from partners including StartUp Britain, Virgin Media, Wired and TEDx. A number of the JCI Sheffield Council Team attended the launch meeting for 2012 and we are looking forward to getting involved! Sheffield is building a strong reputation for innovation and new technology businesses including digital media and advanced manufacturing, so I was delighted to go and help celebrate this reputation and encourage more young professionals and businesses to do the same! Last year I manned a stand for JCI and attended a number of the key note speakers during the event. The line up included the Secretary of State for Business, Rt Hon Dr Vince Cable MP, who gave an overview of some key enterprise initiatives, Peter Jones CBE who gave an inspirational speech about his journey in building his business, James Averdieck, founder of Gü Puds, Julie Meyer, founder of Ariadne Capital and Wilfred Emmanuel-Jones, founder of the Black Farmer. 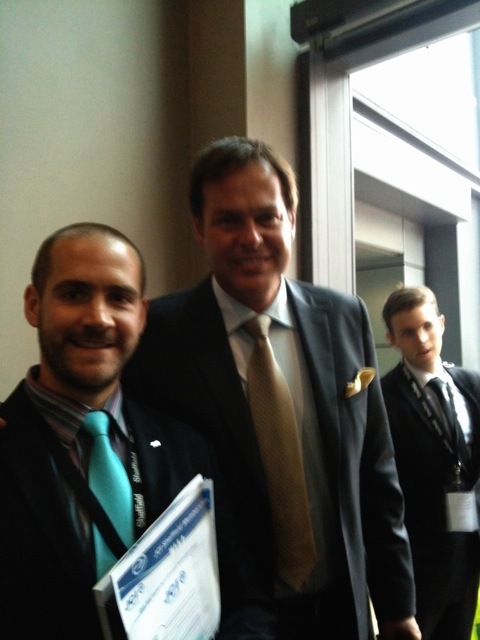 I was so ‘empowered’ following the talk I attended from Peter Jones that I plucked up the courage to go make my way through the crowds and thank him personally for the inspiration and give him some information about JCI; of course taking the opportunity to get a picture of the moment! !